Before leaving for Detroit I prepared as much as I could for the YWCA Women’s Tri, knowing I’d be on a tight time crunch when I arrived home Saturday night. I setup my bike for racing and piled up whatever clothes and race gear that I could. When I arrived home I was still running around like a maniac unpacking, repacking and of course eating. While in spastic rush mode I dropped a bowl in my kitchen, disaster. It shattered into about 1000 tiny pieces in the kitchen and into my porch. After cleaning that up I was definitely ready for bed. Typically I like to get to transition first thing when it opens, but getting to bed late I slept in a bit longer than usual. Somehow I managed to still be the first person on my rack, but there were many other women already setting up. 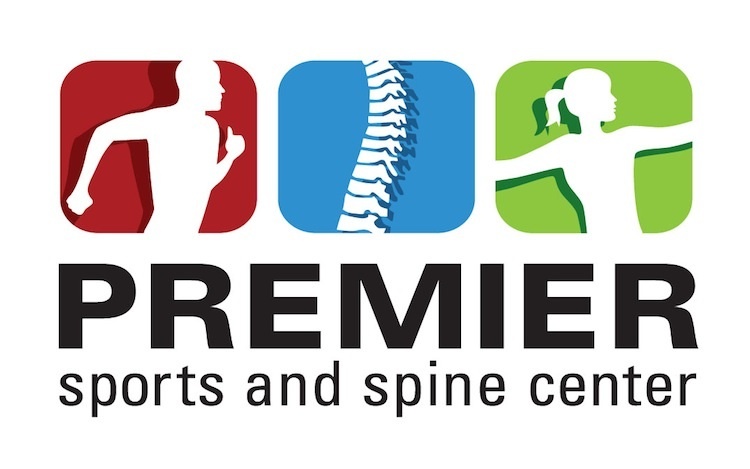 The first of many nice things about this race is that they limit each rack to only have 7-8 athletes allowing each person ample space in transition. After dropping my gear I went to check out how T1 and T2 would flow. Next I took my bike out for a quick warm-up ride. Something on my bike was sounding a bit off, I couldn’t put my finger on what was making the noise and it wasn’t consistent and wasn’t something I had heard before. The noise seemed to go away so I wasn’t too worried. I racked my bike and did a quick run warm-up and stretch. By the time I got back it was time to clear transition, so I quickly did the final touches on my gear, grabbed my wetsuit and headed to the beach. Claire Bootsma and I before the start. After getting into my wetsuit I jumped into the pool like water to do a quick swim warm-up. A few minutes later the first heat of elite ladies was lining up at the start. Not too long and we were off. I took the outside to avoid contact with others as much as possible. Rounding the first buoy I started thinking to myself, what did I get myself into? I’d never raced back to back days before; this was not going to feel good. At that point I told myself to have fun, enjoy it and be as aggressive as I can. The shoreline came quickly, skipping through the shallow water and onto the shore the crowd was loudly cheering us on. 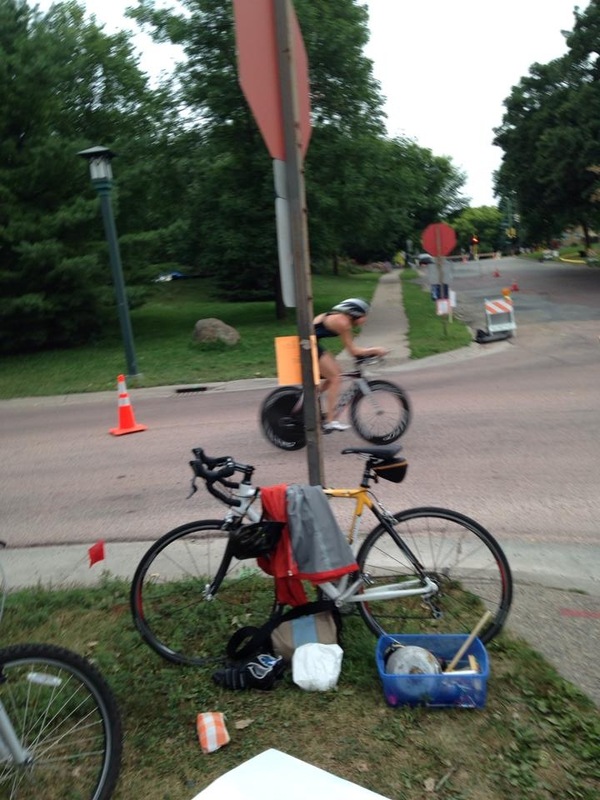 I hustled through transition, my wetsuit peeled off with ease; I got my helmet on and rushed to the mount line. The lead motorcycle wasn’t ready for me but he caught up quickly. After a disappointing bike in Milwaukee and a draft race the day before I was ready to hammer it out on the bike as hard as I could. From the start I was feeling good and I was maintaining a higher cadence than usual. I knew if I over-worked the bike it could make the run really painful but I decided it was worth the risk to see what I could do. A couple miles into the ride, that odd sound that I was hearing during warm-up started again. I just kept hoping that I’d make it to the finish line without something breaking. Crossing the Ford Bridge looking down to River Road, I was trying to spot the next rider but I couldn’t see anyone. As I turned back down Minnehaha Parkway headed to Nokomis a large number of the ladies just headed out on their ride. I heard a few cheers which motivated me to keep a strong pace going. The cheers continued around Nokomis Parkway and I was happy to arrive at transition without issue. I racked my bike and fumbled shoving my feet into my run shoes. Crowds of people were cheering as I headed out for my run. I was happy to see that there was a lead biker to take me around the lake, none other than one of the best Gear West Mechanics, Jared Voorhees. Running around the first section of the lake I could see the bikers coming in. I was nervous because I didn’t see my sister Lisa Lendway so I was hoping somehow I missed her. After completing the daunting out and back onto Cedar bridge I knew I just needed to hold onto my pace the rest of the run. After mile 2 I looked at my watch and I was surprised to see I was under 6:20 pace. I was nervous for the pain of the mile ahead but tried to keep my mind in a good place to finish the race. Nearing the finish line Jared gave me the nice reminder to smile as I finish the race. I usually forget but I’m pretty sure I smiled and gave it a good sprint to the finish. I was pleasantly surprised to see 1:03 on the clock as I was coming in, which probably helped my smile. Lisa and I post race. I finished in 1:03:16, 4:09 under the course record. I was thrilled with my bike split and the run split that followed. Waiting with my family at the finish line, people were starting to cheer again, I turned to see what was happening and it was my sister coming up to the finish line. I was so excited to see Lisa crossing the line after me. I was proud of Lisa for hanging on in the run, as Gaby Bunten was just a few yards off. Stopwatch Greg & Mom couldn’t have been happier. Now for the post-race piece, honestly this is one of the best post-race parties I’ve been to. By far the best food spread I’ve seen at a race. Race directors should get in touch with Nicole Cueno to talk about food because she’s got it exactly right. Fruit, nuts, dried fruit, M&M’s, sandwiches, chips, animal crackers and much more. 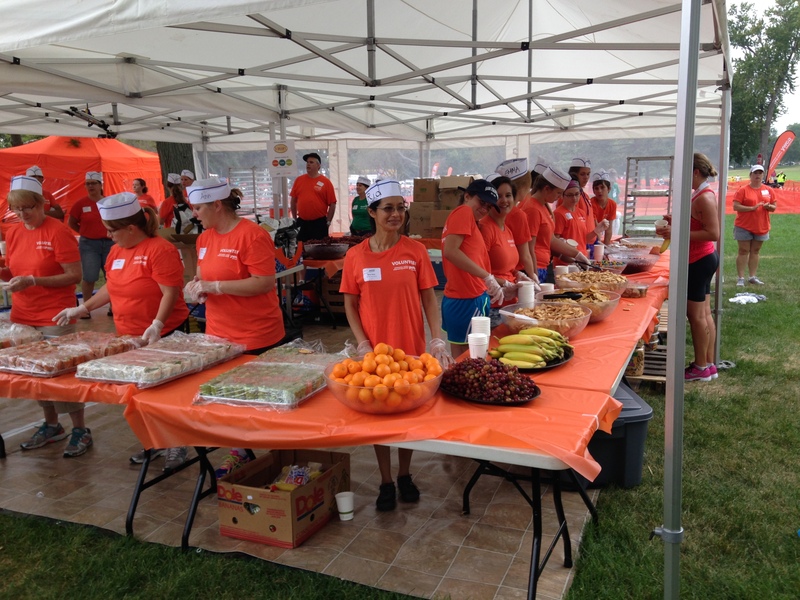 There were also many volunteers there to serve you your food with huge smiles and cute hats. In this process they generate almost zero waste with everything being recyclable or compostable. I’d have to look up the numbers but the previous year they only had about 30 pounds of trash. For a race of 1250 women, plus volunteers and spectators; that is down-right amazing and definitely makes me proud to be a part of this race. The awards are awesome and practical, and I’m a HUGE fan of practical. Instead of a trophy they give you a nice certificate and sweet swag from Gear West. They also give out awards for the fastest sister-sister, mother-daughter and life-partner racers. It was pretty awesome to win the sister-sister category with Lisa. The second place sister-sister team was made up of sisters that swam at St. Olaf while Lisa and I were swimming at Macalester, pretty cool. Gear West also donated some seriously cool prizes that were given away after awards such as a bike and a Garmin watch! It doesn’t get much better than that! A few other cool things to note about the race, there were over 400 first time racers. Many races are lucky to get that many entrants. The race caters to newbies by allowing the use of a noodle on the swim or allowing you to race with a buddy. 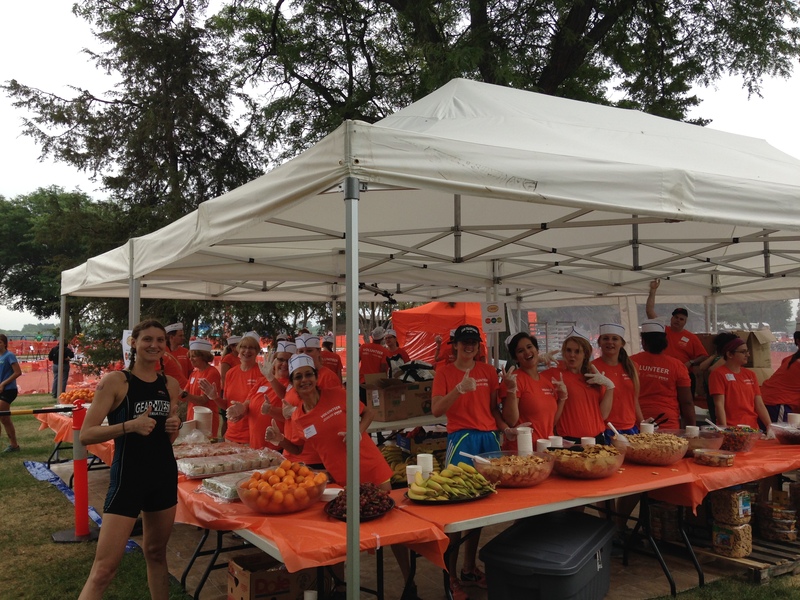 We all know that once you do a tri you’re hooked so we really should thank the YWCA tri for helping grow our community. 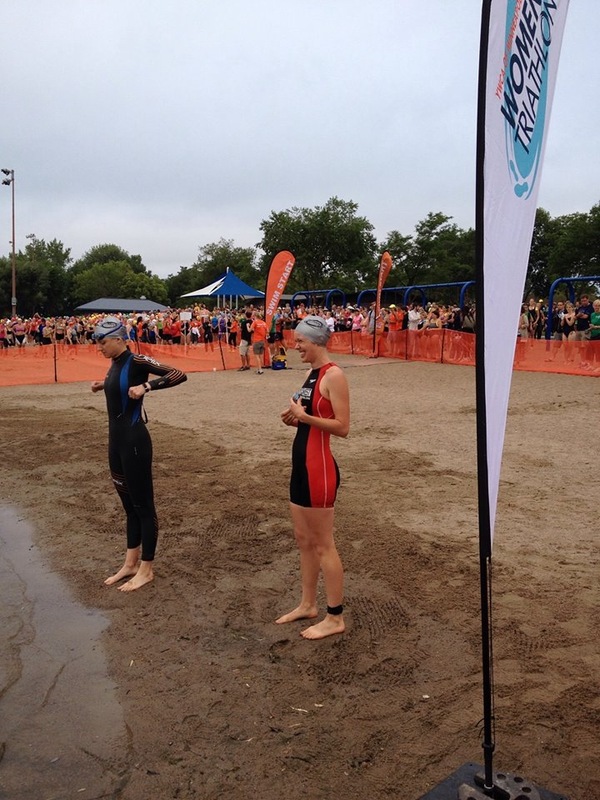 The YWCA tri is really like the ‘gateway’ tri for women. The swag bag you got was unlike any other and completely practical. The mini backpack was a clear waterproof material, great for keeping gear dry in all elements, practical. The race organizers go the extra mile and put your name on your race bib so throughout the course folks can cheer you on by name. I’ve kept all my race bibs since I’ve started racing so it will be a unique addition to my collection. A huge thanks to Nicole and all of her volunteers for organizing an amazing, empowering event for women. I hope to be a part of this event in the future. It was great to see so many women out racing. If you’re a woman and haven’t raced this tri I highly recommend it. Men, don’t feel left out, you can be a part of the event by volunteering, I promise you won’t regret it. If you don’t believe me ask Devon Palmer, he’s been volunteering there the past few years. 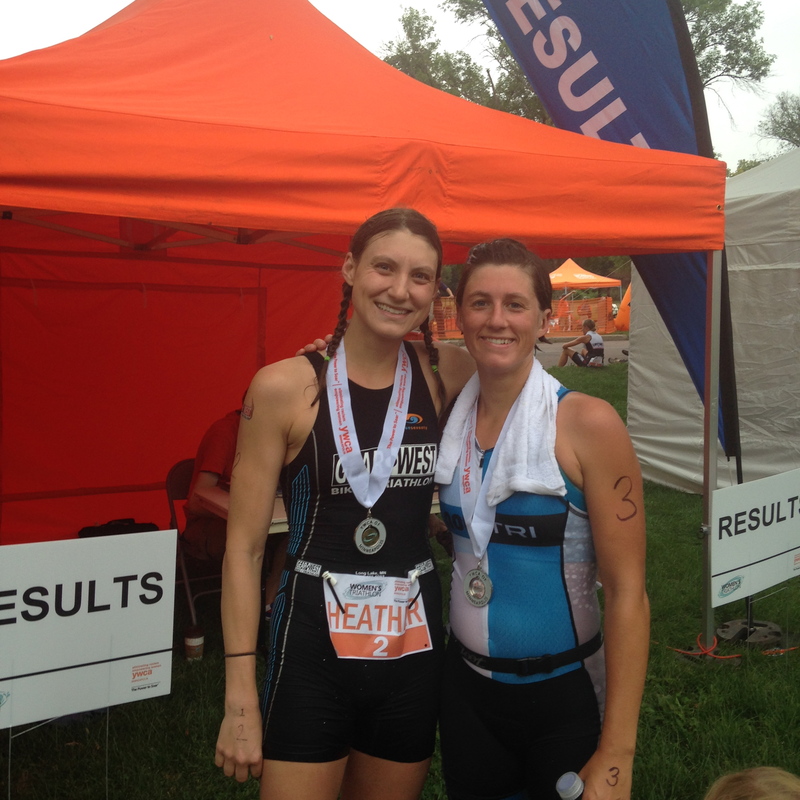 View YWCA Women’s Tri results. The season end is nearing so good luck to those racing this weekend! If you’re not racing you should check out the show, up in Edmonton. Saturday the elite women race at noon (Mountain Time). I’m excited for the showdown that could happen here. US women, Gwen Jorgensen and Sarah Groff, are rated 1-2 and Sarah Haskins is on the start list. Sarah Haskins hasn’t raced a WTS or World Cup event this year and hasn’t raced since Escape from Alcatraz due to injury, but she won all her races this year so I’m excited to see what she’ll throw in the mix. The men race Sunday at noon. I expect a great show with Javier Gomez, who will be raring to go after a rare DNF in Stockholm last weekend, the dominating Brownlee brothers, Mario Mola and Richard Murray. You can watch it live on triathlon.tv. You can follow all the racing via the internet live here. Food was excellent, look at that, and all smiles! Thanks volunteers!